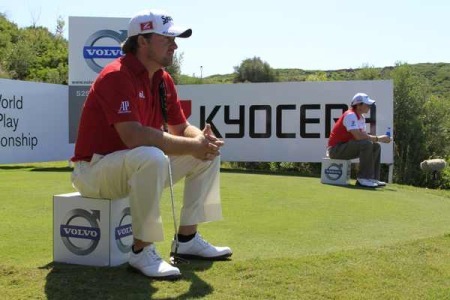 Graeme McDowell knows he has to be sharper in other areas to combat the game’s power players. Photo Kenneth E. Dennis/www.kendennisphoto.comGraeme McDowell wants a Sunday showdown with “Wee-Mac” Rory McIlroy in 2013 as he bids to add another major to his 2010 US Open victory. The Ulster ace was “relieved” to end his two-year victory drought in Tiger Woods’ World Challenge on Sunday. Now “G-Mac” - up 10 places to world No 14 - is determined to use his California dream win as a springboard to more success next season. And if that means a final day battle with McIlroy with a major on the line, he’s fine with that. Combating the big hitters with his own arsenal of weapons is all part of the challenge. Confessing that he was inspired by McIlroy’s stunning year, McDowell said: “There’s no doubt. I’ve been envious of what he’s achieved the last four or five months. I’m sure every player on the planet is. “But it’s just motivated me, showed me what’s possible. “I’m proud of what he’s achieved, just proud to call him a friend, and I’ve seen his career develop the last four or five years. And he’s awesome. “I talked a couple of years ago about kind of Rory being my little radar blocker - let him take all the press and accolades and I just kind of slipped under the radar. “I won the U.S Open kind of doing that. I kind of got thrust back into the limelight a little bit for the year and a half after that. But what he’s doing, you know, it’s tough not to be inspired by that. “I’m not quite sure if I’ve got that type of game inside me that he’s playing right now because he’s on another stratosphere from everyone else right now. But certainly he inspires me to see how good someone can be and how focused someone can be. “And I guess in my career I’ve sort of rubbed shoulders with players better than me, players I feel like I can learn things from and people that can motivate me. McDowell has an amazing record in the Golden State, where he won the 2010 US Open at Pebble Beach and now has two wins and a second place finish in three appearances in Tiger’s end of season bash. He knows that he can never play the same game as big-hitting McIlroy but he’s confident that he has finally come to terms with the high expectations that were heaped on his shoulders following that maiden major win. “You know, when you see a guy like Rory McIlroy doing what he’s doing right now, yeah, it’s tough to not have that little bit of envy. I know I’ll never have a game like that. I guess I’ve pretty much kind of come to terms with the fact I’ll not be able to hit 350 through the air any time soon. And like I say, he’s overly impressive. Describing his two-year winless streak since he won four times in 2010 and sank the winning put in the Ryder Cup, McDowell explained: “The first eight months were just an absolute write-off. “I just haven’t been myself. Frustration. Dealing with my new status, I guess, within the game. Recently engaged, he was in the final group on the last day at both the US Open and The Open but ended up second at the Olympic Club and fifth at Royal Lytham. He said: “I guess this year has been frustrating born out of some great golf. Getting in the last group of some major championships is what I dream of. “Yes, I’d like to win those, but you can’t win them all and it is frustrating at this point in time. “The game hasn’t really given me a lot of love this year, but this win will certainly give me something nice to think about in the off season. “This 10 weeks is huge for me really just from a resetting and recharging and resetting my goals and getting ready for a big year next year. McDowell will be busy during his 10-week break as he prepares to move into a palatial new home at exclusive Lake Nona and open a bar-restaurant nearby. Named “Nona Blue” in honour of the colours of the European Ryder Cup team, he said: “Traditionally when I win an event I call home to my home golf club in Portrush, Rathmore. After pocketing a $1.2m Christmas bonus thanks to Tiger, picking up the tab won’t be a problem. Getting his 2013 schedule right could be tricker and he has decided to take 10 weeks off, skip Europe’s desert swing and play less early in the season so he’s fresher for the summer majors, the FedEx Cup series and the new European Tour finale. “I think it’s fair to say I was not my best at the Ryder Cup. I was burned out. I was tired. I was running on fumes. I had two weeks off between the FedEx Playoffs and the Ryder Cup, and it wasn’t enough. I needed to switch off completely. “I took three weeks off after the Ryder Cup, and really two and a half of those were no golf; completely relaxation, and I came into this run of events a lot fresher, a little bit more up for it. Apart from hurting my hand in China, I’ve actually played some decent golf, despite my 52nd place in Dubai or 53 or whatever it was last week. “I knew in my heart of hearts that I actually swung the clubs pretty good last week. I just needed to get hot on the greens. And the belief was there. “It’s energy levels, though. I made a mistake this summer. I played too much golf. Probably in hindsight I shouldn’t have played the first FedExCup playoff event in Barclays. But I played it. It was too late to start withdrawing. I was in too deep. Tiger Woods will be looking anxious over his shoulder for Irish duo Graeme McDowell and Rory McIlroy when he bids for a hat-trick of Open Championship wins over the Old Course next week. Graeme McDowell and Rory McIlroy on the fourth green at Finca Cortesin. Photo: Eoin Clarke/Golffile.ieGraeme McDowell won’t hesitate to give bosom buddy Rory McIlroy the cold shoulder if they clash for Open glory this week. McDowell has been flying under the radar since the Holywood wonder boy took his US Open title from him at Congressional last month. And that’s just perfect for the Portrush supremo who insists he’d love the chance to freeze out his pal if they go head-to-head with the Claret Jug on the line on Sunday. Graeme McDowell believes Rory McIlroy was born to deal with being a major winner. Photo Eoin Clarke/Golffile 2011Graeme McDowell does not believe that Rory McIlroy will suffer the head-crushing, Major championship sized hangover that saw his 2010 dream season swiftly turn into a six-month nightmare in 2011.